- Helps to avoid the side effects that can be associated with taking painkillers orally. - Can be applied whenever required, so there's no need to wait 4 hours between treatments. - Convenient and portable. 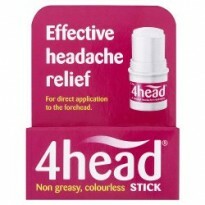 The neat and handy applicator stick is convenient for use whenever a headache creeps up, whether at work, home or on the move. - Cosmetically acceptable. 4head Stick is specially formulated to be non-greasy and colourless on application, and it shouldn't interfere with make-up. - No need to swallow tablets, pills or caplets - avoids the inconvenience of having to swallow these with a drink or food. 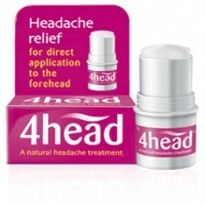 Ideal if you have difficulty or dislike swallowing headache pills.